Firstly, HAPPY NEW YEAR all:) I’ve been a little bit on the quiet side over the holiday season; we’ve had a great old time drinking, eating and being merry! 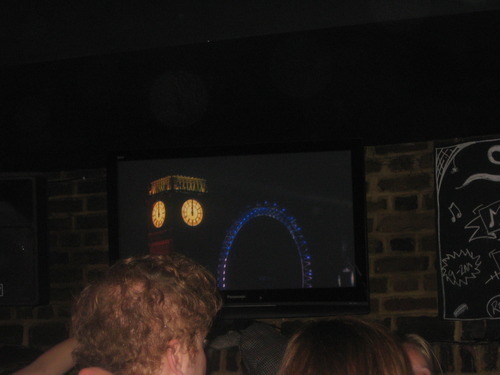 For this years new years eve, we were at a bit of a loose end… we generally don’t really like NYE that much. I’m usually melancholy before midnight and it’s all a big mess! This year we went for a lovely meal on Upper Street in Islington and then headed back to our local, The Island Queen, as we couldn’t be chewed with the hassle and bustle of Upper Street. We got seated at the bar and got the Aspalls-a-flowing. But then, James went to the bar at about 10:15 and was refused to be served because we didn’t have a ‘booking’. I was fuming to say the very least! The bar staff said that we had to have a reservation of a table to be able to stay and be served…there were no signs ANYWHERE in the pub stating you would need a reservation ANYWHERE! We had been in the Island Queen only on Boxing Day and there were no signs, nothing on their ‘website’ and the staff certainly didn’t mention anything. I wanted to place a complaint. But I think them losing our custom is more than adequate thanks. So hey-ho and off we went, straight back to Upper Street… We ended up in Slim Jims at the top end of Upper Street – it’s an excellent bar… if you like New York “dive bars” you will LOVE Slim Jims! And we do, so we do! 🙂 We ended up seeing the New Year in at Slim Jims in the end and had an absolutely brilliant time. Wishing you all health, wealth and happiness in 2010! I know a lot of you already know this, because I’ve had a lot of you have already subscribed; but I can also see that a lot of you aren’t following the activation link to successfully subscribe to get JudyPink in your inbox! Please ensure you follow the directions in the subscription email and completely activate your subscription – or it won’t work! Which would be sadtimes! Terribly sorry to announce…we’ve moved house, again! So no internet for about 3 weeks! Rubbish! I’ll do what I can inbetween the lack of web and unpacking! I will indeed be posting photos of said new house as we think it’s our best yet! 😀 We love it, and we love Angel Islington! This is the view of Regents Canal from our living room window! It literally takes 25 minutes to get to work for me, and about 8 minutes for James to cycle to work! Amazing! No more horrible commute, thanks TFL for nothing!